Regular upkeep, service, and maintenance of your vehicle will help keep it running in top condition for many years, possibly even multiple decades. Taking care of small repairs as necessary is one way to save yourself money in the long run. A car is a serious investment, and proper care should always be practiced. Furthermore, keeping up with regular maintenance helps avoid even small repairs by focusing on preventative care for your vehicle. That’s why Clarke’s Discount offers free diagnosis for any and all possible repairs and automotive services in Aloha, Beaverton, and Hillsboro. If you can sense there’s something wrong with your car but aren’t sure what, or if you know exactly what the problem is and need a reliable mechanic to take care of the dirty work for you, you can count on us to accurately diagnose the problem and propose a solution. Oil and filter changes: Oil and filters should be changed between 3,000 and 5,000 miles on average. For a typical commuter in Aloha, this is about every four to five months. Some vehicles may need more oil added between the changes to keep the engine well lubricated. Factory scheduled maintenance: No one knows which services should be completed when better than the factory who made your vehicle. Each car comes with a recommended maintenance schedule. Tire rotation: Vehicle owners should rotate their tires twice a year or every 6,000 to 8,000 miles — whichever comes first. Wear on tires is not consistent, so rotation during the year helps the car use the tires evenly. Headlight aiming: After your car goes over so many bumps and possibly hits a few too many potholes, headlights can be jostled out of place. Proper headlight alignment means a clearly illuminated path and helps other drivers on the road see your vehicle as it is. Transmission fluid service: The transmission makes sure your car can shift as intended, and it relies on clean fluids to make these shifts as easy as possible. Transmission fluid doesn’t need to be changed as frequently as some others. Most manufacturers recommend changing the fluid between 30,000 and 60,000 miles. Windshield wipers: We’re no strangers to the rain here in Aloha, so it’s obvious that well-maintained windshield wipers make driving in a storm possible. Belts and hoses: A snapped belt or hose can cause expensive damages to the engine. Regular inspection of the many belts and hoses that help operate your car can lead to early identification of a possible problem. Over time, the belts and hoses wear down because of the constant engine vibration as well as natural pollutants. Battery change-over and charging: Avoid getting stranded and in need of a jump by replacing your car battery every three years. Many batteries lose complete reliability after four or five years. Cooling system flush and exchange: The cooling system relies on a healthy radiator. The system should be flushed with new antifreeze and conditioner every five years or 30,000 miles. 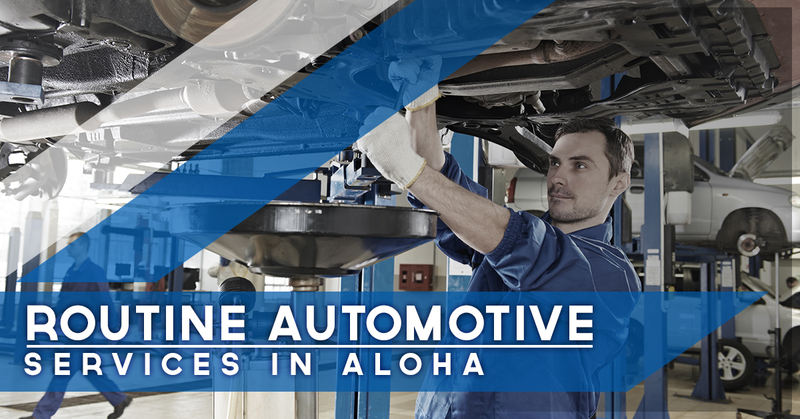 For more than 30 years, Clarke’s Discount has been serving the Aloha community with discount automotive services. We abide by our motto to provide trustworthy auto care and keep all services in line with factory warranties. We know that car repairs and regular maintenance can be a tough expense for many people. That’s why we offer many promotions, specials, discounts, and coupons to help curb the cost of high-quality auto care. We do our best to keep you posted about current specials as well as give advance notice about upcoming promotions so you can decide the best time to maintain your vehicle. We specialize in the repair and maintenance of most Domestic and Asian vehicles.